Forget Mario! These characters need their time in the spot light. Though Bonk didn’t have the best launching platform he still made enough of mark to gardner two legitimate sequels and a rereleases on various consoles. Fighting his way though dinosaur baddies and prehistoric obstacles, Bonk is one of the greatest lesser know platformer heroes. Though Bonks main attacks include his gigantic noggin he also can use his teeth to climb trees and scale walls. Apparently cavemen had very strong jaws. A new Bonk title may be out of the question, but a enhanced remake (a la Cave Story 3D) could be a hit. Scopri Subito le migliori Offerte di Oggi per la R4i Nintendo 3DS e la PS3 Break in uno degli eCommerce più affidabili cha ho Provato! la R4 Revolution con Pennino in REGALO! la R4i – R4i Nintendo con Pennino e Software in REGALO! Crash Bandicoot, much like Sonic the Hedgehog, was the star of a direct Nintendo competitor. No one ever though we’d see a Crash game on a Nintendo system, but just like Sonic he eventually made his way over to the Big N. The first three Crash Bandicoot titles are classics and feature some of the best 90′s platforming known to gamedom. Crash has fallen on hard times since he was dropped by developer Naughty Dog, so why not rive the spunky marsupiale? Spyro has made a HUGE come back with the Skylanders series, so it could definitely work out. Famed developer Treasure is well know for turning bullet hell in to bullet heaven. The studio behind theSin and Punishment series knows plenty about how to put together a stellar run-and-gun platformer. Treasure’s first game, Gunstar Heroes was one of the must-have Sega Genesis titles of the early 90s. The Heroes have already made the jump to a Nintendo handheld with the release of Gunstar Super Heroes on the Game Boy Advance, but we need a new Gunstar Heroes in our lives. Treasure is still going strong so let’s hope they give the 3DS a chance. I’d love to endlessly blast robot goons with a pal via the Nintendo Network. Mario’s bizarre doppelganger has been delighting gamers for years with his whacky antics. 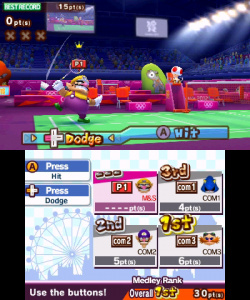 Know for his lust for gold and…um… mini-games, Wario truly deserves his own 3DS title. Whether Nintendo goes for a three dimensional (Wario Land on GameCube) or hand drawn (Wario Land: Shake It for Wii) look they could certainly make an eye popping platformer we all could enjoy. Super Mario 3D Land was a critical and financial success so it shouldn’t take much for Nintendo to whip up Super Wario 3D Land, right? Of all the characters on this list, Toku is probably the least known. Toku has only stared in two games to date and they have both been Wii Ware titles. That being said, they are two of the best Wii Ware titles to ever grace Nintendo’s virtual marketplace. Toku is a young boy who is tasked with saving his village by harnessing the smooth and forceful power of the wind. The LostWinds titles have been ported to the iPad, and they work very well with touch controls. What other handheld devices are known for their touch screens? Oh yeah, the DS line. 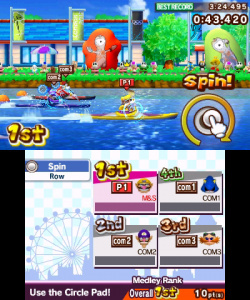 Players could control the top screen’s wind action by using the touch screen! Woosh! Mega Man has taken many forms over the years, but his platforming roots run deep. The Mega Man X series is a particularly awesome showing of how Mega Man titles can be both difficult and fun. Blasting enemies as the Blue Bomber would be a sight for sore eyes since Capcom decided to cancel the highly anticipated Mega Man Legends 3 for the 3DS. It would be nice to see developers go the 2.5D route with Mega Man, giving him a sleek futuristic backdrop and an arsenal of new power-ups. We already know destroying baddies looks great in 3D, now we just need Capcom to follow through and give us the Mega Man platformer we’ve been waiting for. Though many think “Pac-Man” when the name Namco comes up, the name you should be thinking of is “Klonoa!” This peppy little bunny with a heart of gold has been saving the world for longer than you know. Though he started on the PlayStation, Klonoa has had two Game Boy releases as well as a remake for the Wii. Klonoa has only starred in roughly four titles to date, but he has quite the cult following. Why not breath new life in to this wonderful character with a new 3DS outing? Did I mention that Klonoa has Pac-Man on his hat? Is there anything more adorable than a pick puff ball with an insatiable appetite? Kirby has been stealing abilities and floating around Dreamland for over 20 years now and it’s high time he officially made his way to the 3DS. Last year’sKirby Mass Attack was a fresh new take on the series, giving players the ability to control, not one, but ten mini Kirbys (Kirbi?). Nintendo doesn’t need to pull out all the stops for a 3DS Kirby title, because if there is one thing fans want it’s classic Kirby action. Why not simply give us a sequel toKirby’s Return to Dreamland? With the exception of a certain pudgy plumber, Nintendo has never produced a better platformer hero than the amazing Donkey Kong. One would be hard tasked to find a better platforming trilogy than the Donkey Kong Country series on the Super Nintendo. With the run away success of Donkey Kong Country Returns on the Wii, it’s time Nintendo gave us chance to put DK through his paces on the R4i 3DS. Jumping, climbing, pounding the ground – Donkey Kong was made to rule the jungle. Though Rare Ware, the company that made DK a platforming icon, was bought out by Microsoft years ago Nintendo still has the entire Donkey Kong world under it’s belt. Let’s hope King K Rool starts stirring up some trouble soon so we can come to the rescue as the mighty king of swing. 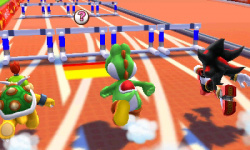 2007’s Mario & Sonic at the Olympic Games on Wii marked the two once arch-nemeses’ – in the eyes of us children of the nineties, anyway – first side-by-side appearance that didn’t involve them attempting to wallop seven shades of snot out of each other. It was a solid sports offering that exemplified the minigame collection genre’s ability to bring players of all ages together and partake in some simple fun. However, as last year’s Mario & Sonic at the London 2012 Olympic Games proved, after three instalments on both Wii and DS the series has dwindled in quality and appeal in the intervening four or five years. The mishmash of overly simplistic gameplay styles of varying quality just doesn’t cut it any more. Which brings us around to Mario & Sonic at the London 2012 Olympic Games for 3DS, a game that epitomises how hit and miss execution can make or break a game of this ilk. The 50+ Olympic events included certainly offer up a great deal of variety; Mario & Sonic 2012 can pride itself on that if nothing else. They’re also never more than a few button presses away thanks to tidily presented and uncluttered menus, so partaking in single or custom set-ups of more than one event – which are referred to as medleys in-game – is a quick, simple exercise. 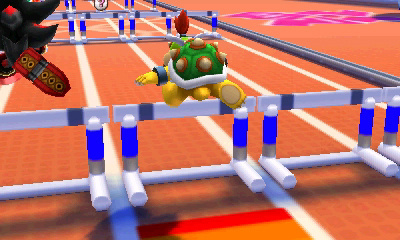 Great presentation extends to the events themselves; the crisp, clean visuals could be mistaken for those of the Wii version on occasion, while the 3D effects are put to good use in a few events – a bird’s eye view of the action makes the added sense of depth invaluable for centring your character in the trampoline event, for example. Unfortunately, while its colossal event list sounds great on paper, Mario & Sonic 2012 suffers from the all too familiar “mixed bag syndrome” that many games in the genre stumble into. Whereas many events are executed well enough – though simultaneously are by no means crowning achievements – there are far too many sports included in which the control schemes are simply ill-conceived. The majority of sports utilising the microphone and gyroscope controls are outright terrible; luckily an ample amount of the touch screen or button-based events are playable enough so that you can feasibly avoid the duff sports while still having a sizeable chunk of content to play. However, even the events that are at the very least bearable suffer from being stripped down versions of their Wii counterparts, relinquishing only the most basic of input to the player. Sports like tennis, badminton and volleyball don’t allow players to move around the court and find the best position from which to return the ball; rather, the AI handles character movement and all you need to concern yourself with is thwacking the ball or shuttlecock in the right direction. Additionally football/soccer, for example, is reduced from full matches to nothing but penalty shoot-outs. If ploughing through every available event via the list – impressive in length though it may be – sounds about as much fun as hugging barbed wire, Mario & Sonic 2012 includes a story mode that introduces new events at a steady pace. The plot opens with Bowser and Dr Eggman holed up inside Big Ben, understandably miffed that they’ve not been invited to the Olympic Games. In retaliation, Eggman has constructed a bevy of machines that are blanketing London in a dense multicoloured mist called the Phantasmal Fog in a bid to get the Games cancelled, with the odd side-effect being that it creates fog-based imitations of our heroes. It’s up to Mario, Sonic and an all-star cast of familiar Nintendo and SEGA faces to put an end to the villains’ scheme and get the London 2012 Olympic Games back on track. The story is divided up into episodes, each one featuring a handful of characters as they try to figure out where the fog has come from and how to stop it. Every episode contains a set number of challenges consisting of up to five predetermined events; gaining a gold medal in (usually half of) the challenges opens up the next episode. Story mode is a marginally more interesting way to be introduced to the various events; however, while it’s cool to find out which characters were included, the story is as bare-bones and flat as they come and feels like unnecessary padding. It’s also a tenuous way in which to link the various events together, concerning itself very little with such oddities as Olympic events being a viable way for the gang to stop the nefarious duo’s diabolical scheme, or how the characters can all of a sudden find themselves transported from Tower Bridge into a packed Olympic venue before the Games have even begun, or even why Sonic for some unexplained reason can’t run the 100m sprint in two seconds flat. It shouldn’t take players longer than five hours to see the story’s conclusion – although there are bonus episodes available upon completion – and once that’s done and dusted, Mario & Sonic 2012 includes both single- and multi-cart multiplayer for up to four people along with a myriad of collectable badges and stickers that are attainable by gaining gold medals in events or spending tokens acquired in-game. Custom event medleys can also be traded, although only locally with friends who also own the game as, bewilderingly, there’s no StreetPass support. The Mario & Sonic games were once a shining example of how minigame collections should be developed. However, while Mario & Sonic at the London 2012 Olympic Games is technically no worse than its forebears, its events are too much of a mixture when it comes to quality and after four years the blemishes and inconsistencies are beginning to wear thin. It’s by no means a train wreck and a valiant first effort for the series in its jump to 3DS, but with the next inevitable release due in two years it’s imperative that Nintendo and SEGA use that time to iron out the wrinkles and make this the all-star collaboration it truly deserves to be.